Routines. Some people love them, some people hate them. I have yet to meet anyone who has no opinion about them. I am a "love them" kind of person, even more so now that I have kids. Personally, I think routines make the world run smoother. My biggest complaint, however, is when the routine gets interrupted. I am not one to run so easily with a bump in the road. Therefore, I try to create routines that allow for these small interruptions. A good example is my December Challenge: Setting up my Evening Routine. One of the first things I learned about daily challenges is to have "trigger" points. For example, after brushing your teeth in the evening, floss. After making your morning coffee, sit down to journal. Before walking up the steps for bed, fill the dishwasher and run it. Each action has another action to "activate" it. I am going to use this same philosophy with my evening routine. I also want my evening routine to be a reverse of my morning routine. This way it will be like closing the circle each and every day. To recall my evening routine, I go through my morning routine in reverse. To recall my morning routine, I go through my evening routine in reverse. There are maybe three times in the year I don't actually go to bed. So, on average, each and every night I get ready for bed and eventually head to bed. Since I don't have a time-limit on this action, it can be done any time I am getting ready for bed. It can even be done away from home! This should be the easiest Challenge. So, here is my plans for my December 2013 28-Day Challenge. This is the alpha stage because I am hoping to expand on this basic, skeletal evening routine. I have intentionally inserted Journal and Meditation in my evening routine because my goal for 2014 is to increase those activities both in the morning and in the evening. The trigger is going to bed. So, there you have it. My 28-Day Challenge for December. The purpose of this routine is so my body will recognize it is time to settle down and get ready for sleep. 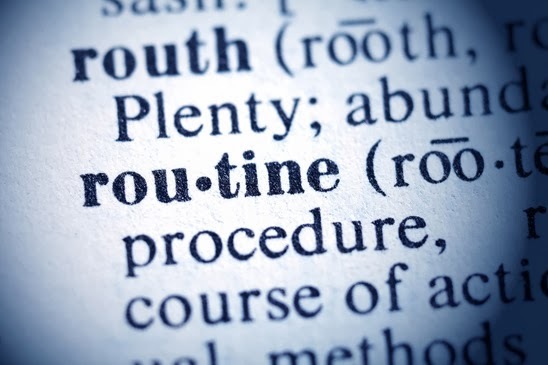 How has a routine helped you and/or your family?